There are two cenotes in the area, one of which is considered the Cenote Sagrado, or Sacred Cenote where sacrifices of valuable objects such as gold, jade, pottery and incense as well as human beings were made to the Maya Rain god, Chaac. 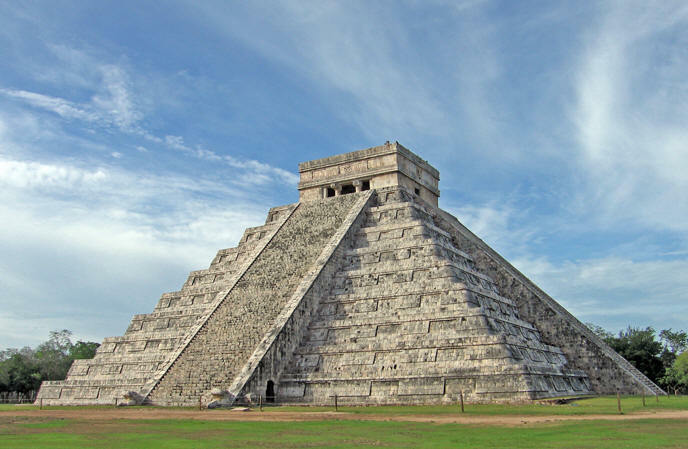 Chich'en Itza was a major economic power in the Northern Maya lowlands during the peak of its civilization. 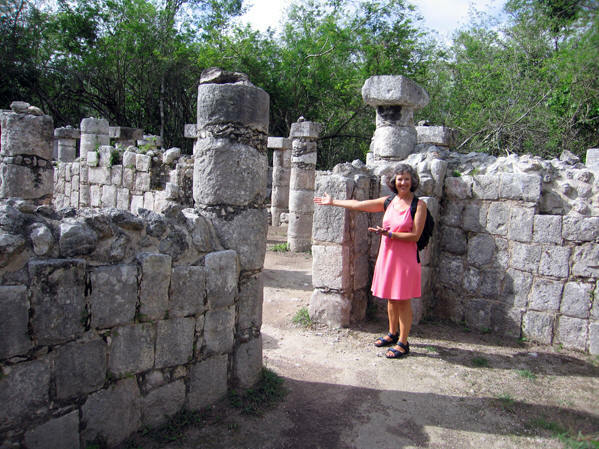 This peninsular settlement capitalized on the water-bourne trade route to obtain exotic items from far away locations such as central Mexico and southern Central America. The most current archeological data now indicates that this civilization had a violent end around A.D. 1000. 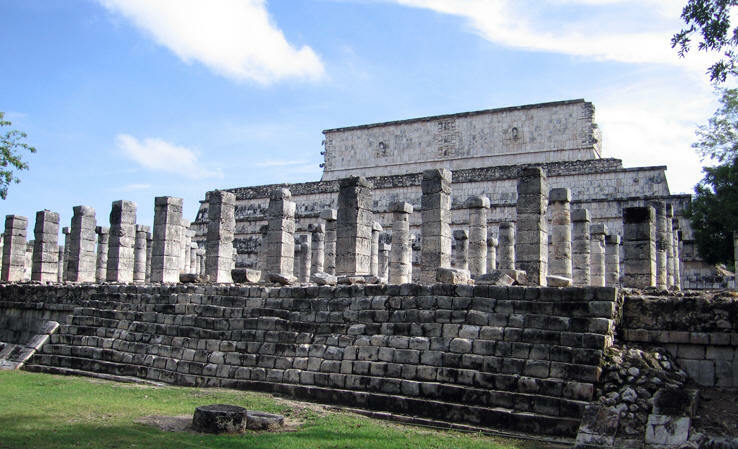 In the center of Chich'en is the Temple of Kulkucan, often referred to as El Castillo, The Castle. 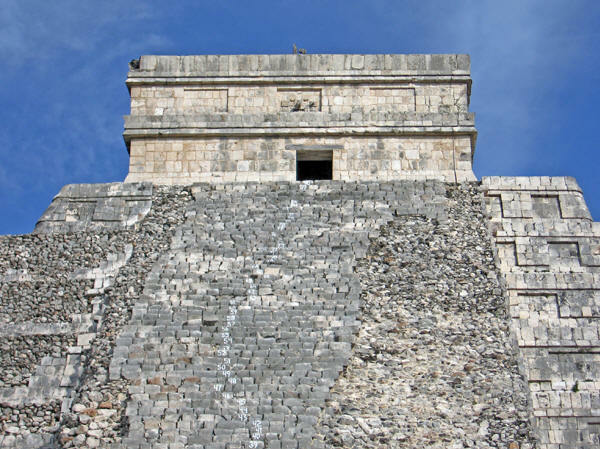 This is a step pyramid with 90 steps up each of the four sides to the temple on top. The 90 steps on four sides represent the four seasons. 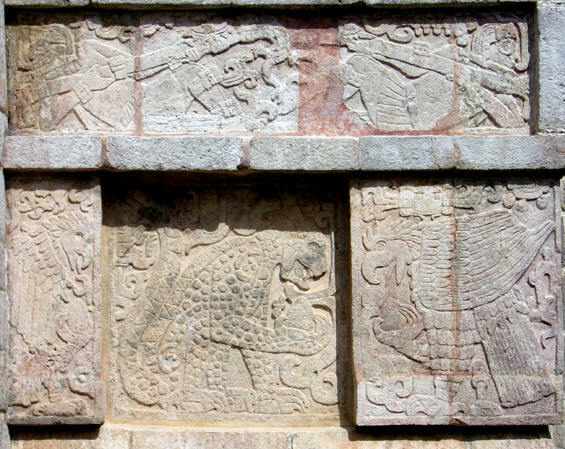 On the Spring and Fall Equinox, during the rising and setting of the sun, the corner of the structure casts a shadow in the shape of a plumed serpent, representative of their god, Kulkucan, along the side of the north staircase. As the sun moves through the sky the plumed serpent appears to slither across the pyramid. 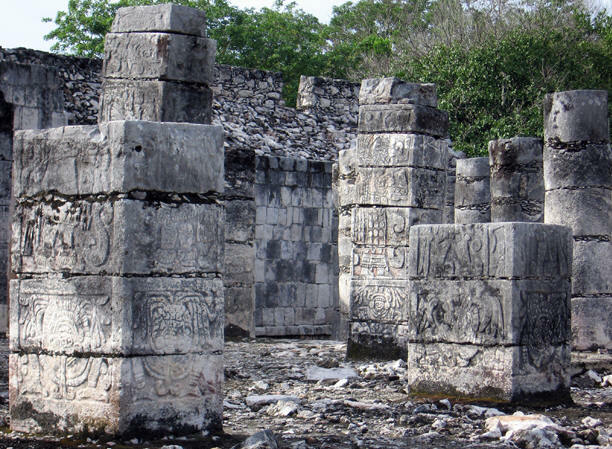 A closer look at the Temple of Kulkucan, the Maya name for Quetzalcoatl, the plumed serpent god of Mesoamerica. Notice that the steps have been numbered, with the 90th step at the top. This gives you a broader view of the 5 square kilometers of grounds of Chich'en Itza for better perspective. This is part of the Temple of Warriors which is also a step pyramid. Hundreds of round and square columns depicting warriors stand here at this temple. 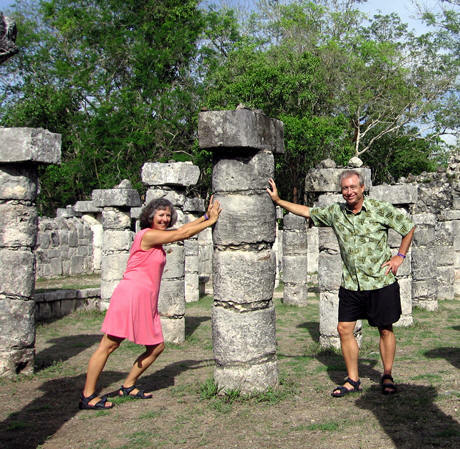 Low bas relief are carved into the stones of these square columns. The warriors, an integral part of the Chich'en Maya culture, stand guard. You can see where the pillars have been cemented together in places. 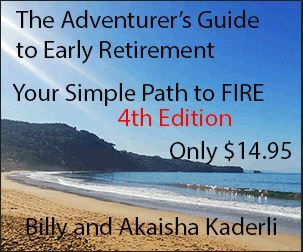 This creates a mesmerizing effect. A broader view of the Temple of Warriors, built for large gatherings. 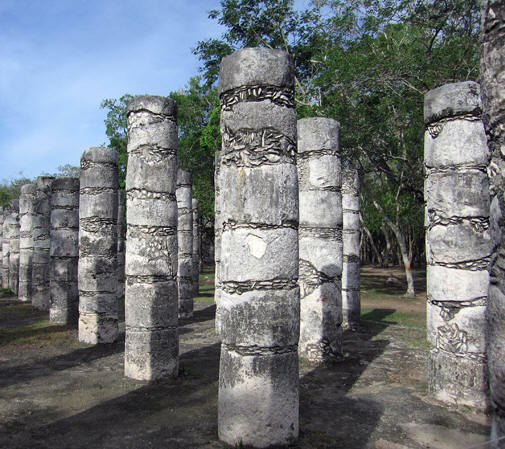 The temple consists of four platforms and it's on the west and south sides that you will find the flanks of 200 round and square columns representing warriors. 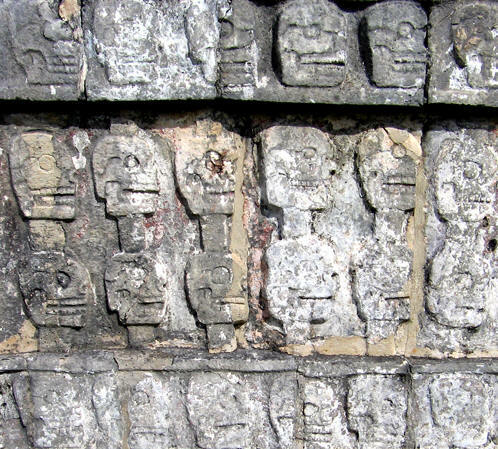 Impressive and clear bas relief of Maya symbols. 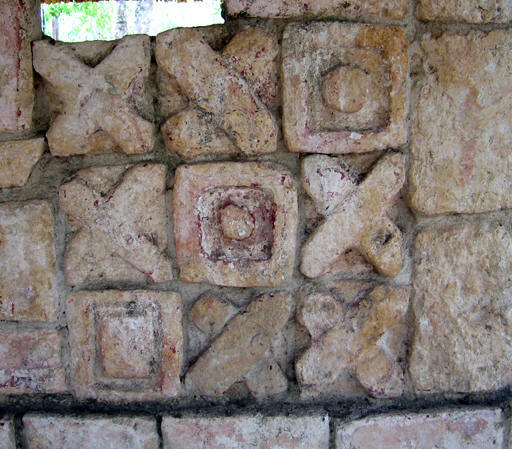 Perhaps this is the 'XO' from the Nahuatl word Xochitli meaning 'flower.' The Mexican day was represented visually by a stylized image of a flower. 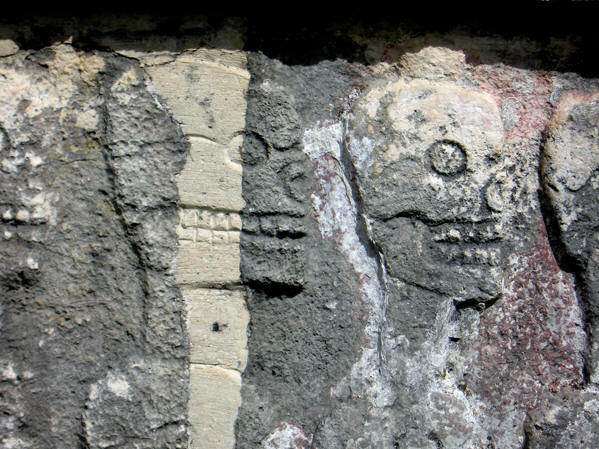 Another more detailed look at the carvings of warriors at Chich'en Itza. 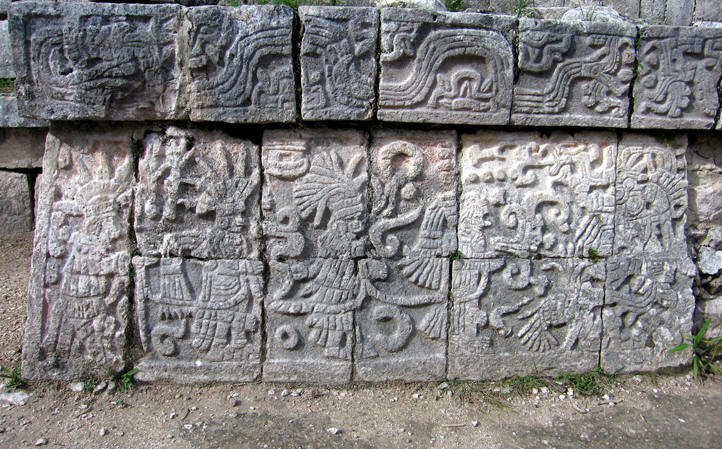 You can see the plumed serpent god of the Maya on the top. 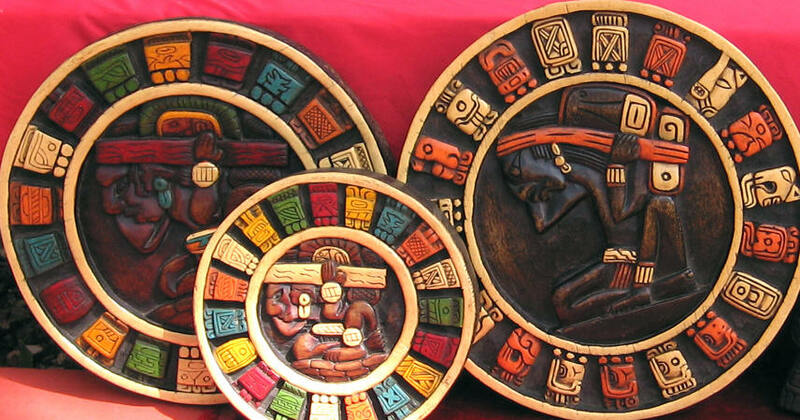 This god, called Kulkucan in Maya culture was called Quetzalcoatl throughout Mesoamerica. He was the giver of breath and the god of the winds. He was a creator deity and identified with the sun. Here we are leaning against some of the pillars around the Market Area to give you an idea of the height. There was a roof on top of these pillars to give shade for market vendors and those who were buying. These people must have been rather small compared to our own physical heritage. Welcome to my living room! Actually, this is another part of the Market Area, divided into various sizes of square rooms for the vendors to sell their wares. It was the captain of the winning ball team who was sacrificed. This was considered to be a very high honor. The losers where shamed. 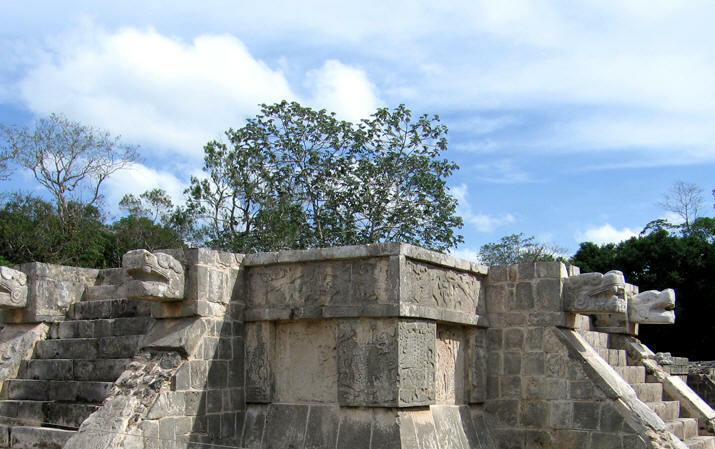 In the entrance to the Lower Temple of the Jaguar, which opens behind the ball court, is another jaguar throne, similar to the one in the inner temple of El Castillo. This one, however, is well worn and is missing paint and other decoration. Jaguars are a symbol of strength, confidence, divinity and general domain and are often found symbolized in Mesoamerican art. You will also see carved eagles here, a symbol that when meditated upon, was believed to bring about mental clarity and telepathic powers. Both the jaguar and the eagles pictured here have human hearts in their grasp. This gives you an idea of how the human sacrifices went! 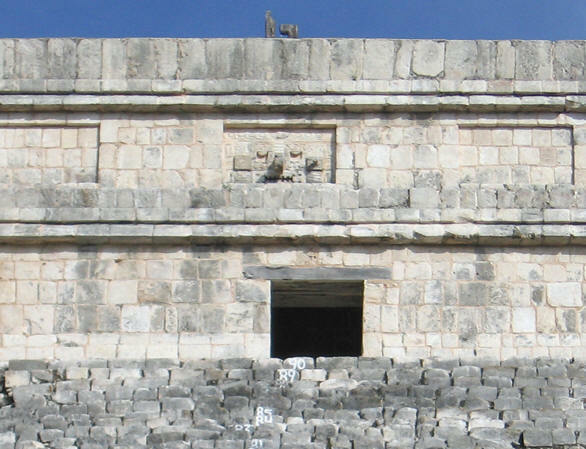 Behind this jaguar temple platform is a walled inscription which depicts a rack of impaled human skulls in bas relief. Here is a closer view. Grizzly, eh? Human sacrifice to the gods was common in this time period and region of the world. On the Chich'en Itza grounds are vendors selling musical instruments made of bamboo, and the tones waft through the grounds creating a timeless atmosphere. 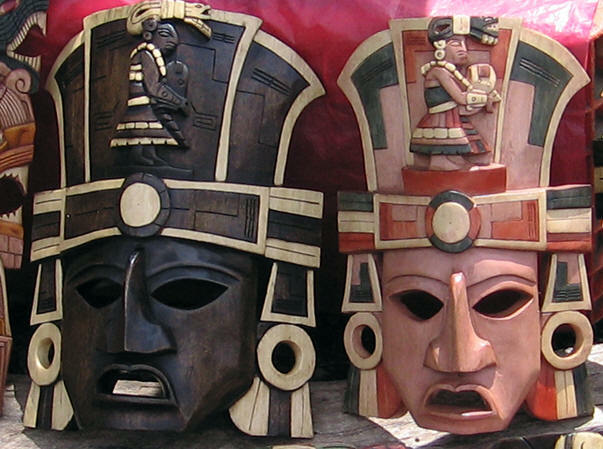 These masks, also for sale, show fierce Maya warriors. 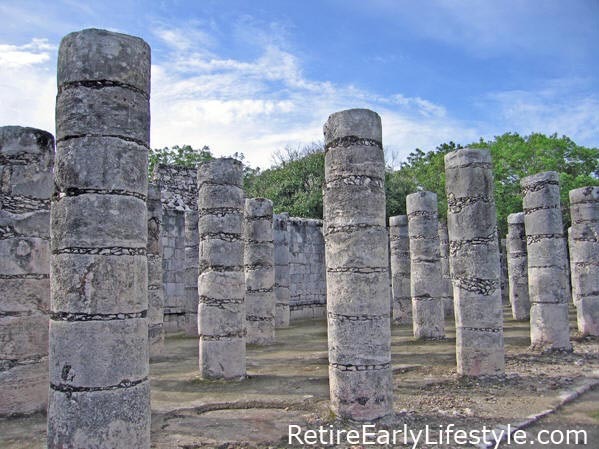 These are replicas of the Maya calendar with their 19 months each consisting of 20 days. Their calendar was considered to be very accurate. 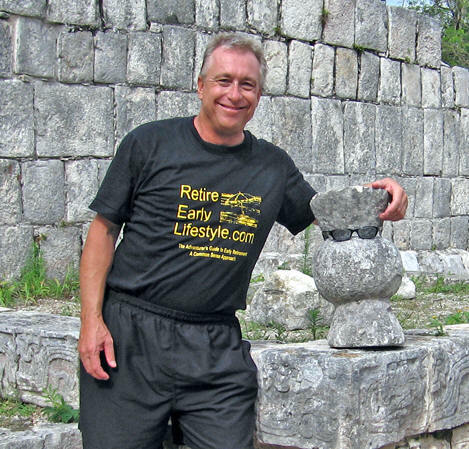 We hired a private driver from Cancun to take us to Chich'en Itza for $150 USD. 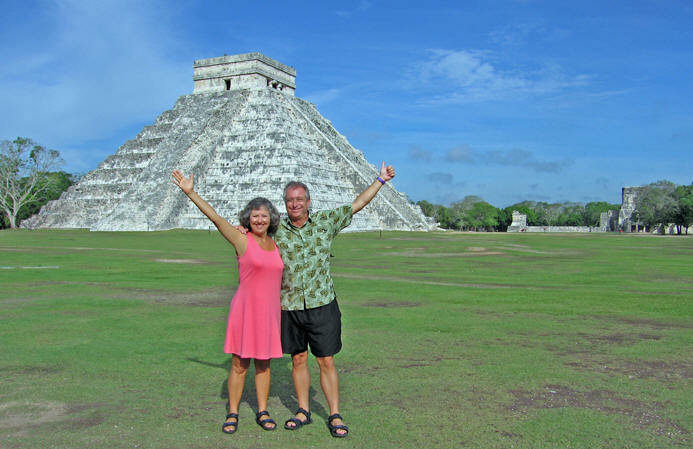 We left Cancun at 5 a.m. and took the toll road on the way there (an extra $28 in tolls) to arrive at 8 a.m. - early enough before the tour busses filled the visitor site. Entrance fee was P48 or $4.80 USD and included a paper bracelet to wear around your wrist while on the grounds. We took the 'libre' road on the way back which was a bit slower, had many 'topes' or road bumps and went through the local towns on the 135 mile return trip to Cancun. 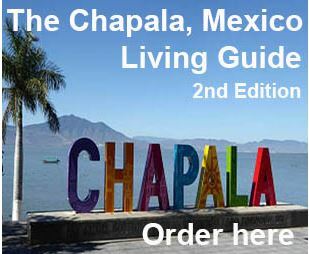 Tour guides are available for all the explanations of the history of Chich'en Itza for about P400-P600 or $40 - $60 USD. 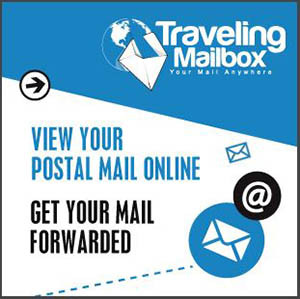 They give tours in English, Spanish, French and German. The Chich'en Itza site is very hot, so bring a hat and some drinking water. There is a tourist center at the entrance where clean toilets, snacks and drinks are available.